Nokia To Bundle Orb MyCasting Service In Upcoming N80 | OhGizmo! We’re hearing word that Nokia will be partnering with Orb Networks and include the Orb MyCasting service right into the upcoming Nokia N80. With this, you’ll be able to access whatever multimedia is stored on your PC, remotely. If it happens to be hooked up to a TV, then you’ll also get that, which is deal so sweet, only a delicious donut tastes better. You have to keep in mind that the N80 is one of the better spec’ed devices to come out from Nokia, and as such is a perfectly suited platform for this sort of integration. The phone features LAN (WLAN), UPnP and quadband GSM coverage and also provides an easy-to-use WLAN wizard (to make connecting to the internet easy), support for internet calls, a robust browser, along with a 3-megapixel camera and a host of other internet-related services. Even better, the interactivity is not one-sided: if you’re watching TV, and you fancy recording something, you can remotely activate Orb’s Digital Video Recorder (DVR) function and then play back those recorded programs to the mobile device whenever you want. 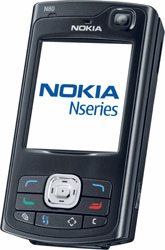 The Nokia N80 is slated to be released in the US in November. Be on the lookout for a hands-on review, right here on OhGizmo, sometime late November, early December. Realmente el tel?fono m?s interesante del mercado de los celulares es el Nokia, N73,, es un tel?fono muy pr?ctico y comodo para tenerlo en el Bolsillo. Tiene la ventaja de tomar fotos de buena calidad y hasta 170 minutos de video.